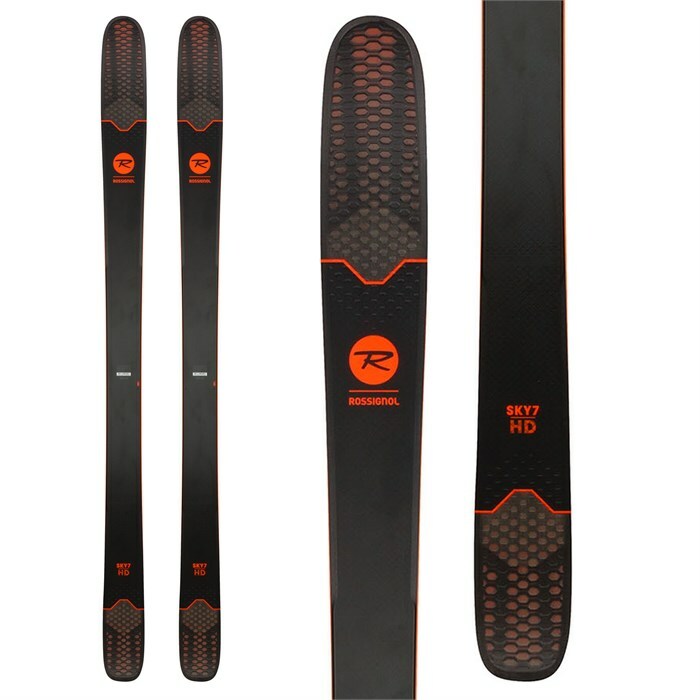 Building off of the versatile Sin 7 design with the added benefit of a lightweight Paulownia woodcore and Rossi's Carbon Alloy Matrix for improved dampening and power, the 98 mm waisted Rossignol Sky 7 HD Skis are the best choice for skiers that want one ski for powder to moguls. The Sky 7 HD Skis also benefit from a brand new Air Tip 2.0 design that takes Rossignol s swing weight reducing design to the next level, further integrating the construction into the overall ski design for a beautiful ski with a silky smooth ride. Freeride Rocker 50% Camber / 50% Progressive Tip & Tail Rocker  Power, energy and grip underfoot. Effortless flotation, steering and speed control in powder. Centered Sidecut  A short sidecut directly underfoot combined with a uniquely tapered tip and tail. The deep radius underfoot provides edge grip and power where you need it while the short length of the sidecut allows easy steering and playfulness. Air Tip 2.0  100% all-new, fully-integrated 3D construction is now lighter and stronger for more balanced performance from tip to tail. The visible internal reinforcement and fully-integrated design eliminates deflection and instability, delivering more concentrated power and energy throughout the ski. Reduced weight at the extremities keeps tips naturally afloat while ensuring ultra-light swing weight, effortless maneuverability, and enhanced ski control. Carbon Alloy Matrix  This brand-new fiber is ushering in a new era of high-efficiency materials. Combining an extremely lightweight design with high mechanical properties, the Carbon Alloy Matrix raises the ski’s performance across the board, whether in terms of grip and versatility, precision and permissiveness, or stability and maneuverability. The Carbon Alloy Matrix is the result of a clever blend of Carbon fiber and Basalt fiber. Carbon provides boost, lightness and power transmission, while Basalt contributes its shock-absorbing and stabilizing properties. Boost your skiing for a white-knuckle experience! Minicap Sidewall  Yes, you can have both - full sidewalls underfoot for edge grip and solid performance, cap at the tips and tails for lightness and durability.